Download & save the appropriate membership form. Then just type in your information and email it to membership@pawsnela.org. Use the buttons below to pay by paypal. You must be an existing or new member to purchase a pet membership. Members are the heart of PAWS! 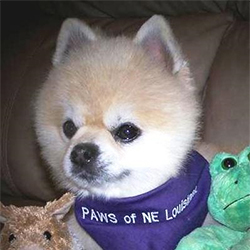 PAWS is funded through donations, memberships and fundraisers. When you become a member, you are joining our efforts to reduce the community pet overpopulation problem in Northeast Louisiana and to promote the human-animal bond. As a thank you for your support, both new and renewing members will receive a special gift. All memberships are valid for 1 year from the date payment is received. Membership renewal reminder letters will be sent out the month before the annual membership is due. All new and renewing members can now get their pets involved with PAWS too! When you join or renew your membership, you can add your pet(s) as members. They will receive a purple PAWS bandana! Don't forget to buy a PAWS membership for your 4 legged friend. Simon says PAWS pet membership bandanas make the perfect fashion statement!